1. For the pickle, put the cucumber in a sieve and sprinkle over the salt; drain over the sink or a bowl for at least 20 minutes. Meanwhile, put the celeriac and onion in a clean tea towel, hold over the sink and squeeze out as much liquid as possible. Tip into a large bowl. Mix in the flour, eggs and caraway; season and set aside. 2. To finish the pickle, put the vinegar and sugar in a bowl and stir to dissolve. Press the salted cucumbers between sheets of kitchen paper to remove any excess moisture, then stir into the vinegar mixture; set aside. Mix the soured cream and dill in a small bowl, season and set aside. 3. Heat the oil in a large frying pan. Dollop heaped tablespoons of latke mixture into the pan; press down with a fork or fish slice. Fry over a medium heat for a few minutes each side, until golden and crisp (you will need to do this in batches). Set aside on a wire rack until you’ve finished cooking – you may need an extra splash of oil for the last batch. 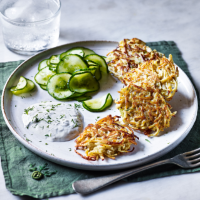 To serve, divide the latkes between 4 plates and add a spoonful each of the dill soured cream and pickled cucumbers. Sprinkle with a little more dill before serving.